If you have a child still still in diapers, chances are you go through quite a few wipes containers over the course of a month! Wipes containers are perfect for reusing, as they are durable, water proof, and the perfect size. There is no need to pitch these when they are empty, as their second life could just be starting! 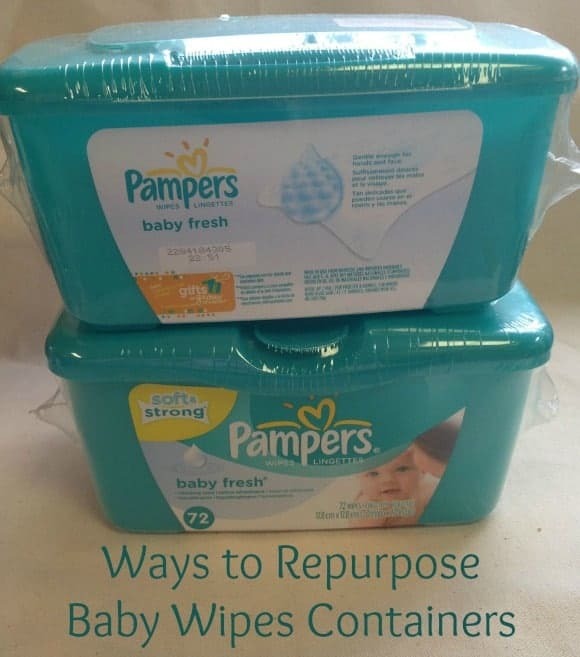 Instead, take a peek at below at the ways to repurpose baby wipes containers! You might just be surprised at how many fun and frugal uses you can get out of these handy and abundant containers. Don’t have a baby? Many of these crafts can still be done using disinfecting wipes container or fresh wipes containers. So really, no baby is necessary to still enjoy these and have frugal fun! So don’t toss those containers, take a look at all of the cool ways you can repurpose them. Before you begin, just rinse your container with warm, soapy water and allow to dry. Once you have done that, you are ready to go! 1. Plastic grocery bag holder. Reuse your old wipe containers by decorating the outside of the container and then refill with plastic bags from the grocery store. When you need a bag, it will be as easy as pulling one out! These durable containers are great for organizing those tiny craft supplies. Wipes containers make a great storage solution for needles, quilting squares, thimbles, scissors, and assorted pins! Just toss them in, close the container, and go. If you are a knitter, you need to try this. Keeping your yarn tangle free and clean from knots is as easy as storing it in an old wipes container and running the yard up through the dispenser. No more wasted yarn or wasted time untangling knots! Use your old wipes containers to neatly stack and store markers, stickers, glues, embellishments, or scrapbooking pens! When you head out for a girl’s weekend to scrapbook, it will be as easy as grabbing your container. 5. Make a peek a boo toy. Kids love opening doors and fining a prize inside. A peek-a-book house for toddlers uses the lids from diaper wipe containers as doors on the house which open up to reveal pictures inside. Just use a picture from a magazine or favorite family photo. Just add a little netting to the empty wipe case, decorate the outside of the container and you have yourself and fancy travel earring case! How easy and practical is that? An empty wipe container is perfect to fill with bandages, small bottles of water, money, medicines, and other items you need when traveling. Just load one up and keep it in your car so if the need arises, you are prepared. Give kiddos a wipe container to decorate and use to store their coins. They will enjoy being able to save money and having a safe treasure chest style container to store it all in. They can even jot down their savings goals and tuck those safely inside. Kids love pulling wipes out of containers. Once the container is empty, fill it with fabric scraps for them to pull out one by one, and then start all over again! You can find scrap fabric by cutting up old sheets, clothing, towels, or any other fabric items you can no longer use. Or, buy inexpensive felt sheets at your local craft store. Kids love treasures. Have them decorate their wipes container with paint, faux stones and jewels, and fill with their found treasures! They can take it on nature walks, store prizes, notes, and more. They will love having their own special treasure chest to store all of their treasures. Don’t you just love these easy ways to repurpose baby wipes containers? Not only are you saving more garbage from the landfill, but you are creative purposeful items you are sure yo get some use out of. Plus, your kids will be able to get in on a lot of this action, and you will see their creativity and imagination take flight! They will love getting in on the repurposing with you, which is great because there is no time like the present to teach them about the importance of reusing items! So gather your empty wipes containers, or ask a friend to save some for you! You will want to give these projects a try and see what you can come up with! Be sure to come back next week to discover more ways to repurpose your child’s items in this great new series! Campbell’s Soup Kits, Charity and Prizes Oh My! Bullying videos – Are they causing more harm than good online? I actually saved the wipe containers and decided to make a mounted wipe holder out of a stuffed animal and could not locate any kind of history on the web, so as a single mommy I went for protecting my product and happy to say it’s in the works and I will be marketing it soon. If you would like to check it out please do not hesitate to email me. quick visit this website, it contains valuable Information. I love the idea of using wipes containers as emergency kits. They’re the perfect size for a first aid kit! Almost forgot…these containers are also good packing cubes for socks, underwear, medications, hair/bathroom accessories, and other small stuff that can get lost in a big suitcase. Great ideas – we used ours for crayons. Luckily I’m done with diapers now! All great ideas. I can always use an extra container to hold things. I love the emergency kit idea, never thought of that! I’m using your idea of an emergency kit. This is a good idea for our cars. Great ideas!! I repurpose mine mostly for my son to use as small toy boxes or to keep his matchbox cars in. These are great ideas. I have a friend who uses hers as toy bins for smaller toys in the kid’s bedroom. Another friend uses them as an easy “travel toy bin” and it keeps the toys for traveling well organized and they are small enough to easily pack in a car. These are great ideas. I am all about repurposing things. With a little decoration they make good recipe boxes too. We create “put in and take out” games for our toddler with the pampers tubs, they love to stick their little hand in and pull things out.